During Advent twelve years ago, I was newly pregnant and very afraid. I should have remembered the angel’s proclamation to Mary, “Do not be afraid.” Instead, because I had waited so long and with so much agony for this second child to be conceived, the news of a growing baby felt too good to be true. I became convinced that my child would be born with serious health problems. My prayers had been answered, but I dimly sensed there must be some price to pay. I had suffered just enough to stop believing in good news and gifts freely offered. The good news of this season is God’s nearness. A son has been born to us, and his name is God-with-us. The good news is that the God who came near has promised to return. Advent is that season when we pinch ourselves awake, we rub the sleep from our eyes, and we remember to watch and wait. “A light shines in the darkness,” and despite everything–everything— we’ve seen, we believe the “darkness has not overcome it” (John 1:5). My son Thaddeus was born at bright noon on my very own birthday. He was healthy and strong, and I held in my arms the answer God had been whispering to me for months: This son is a good gift. No strings attached. That was the good news, and it was absolutely true. Yet my grip on it slipped as Thaddeus grew. He had his first serious allergic reaction at six months old. It was Christmas Eve. We used the epi-pen and drove him to the hospital for the first time when he was two. We did the same when he was three. When he was four, I took him out for a treat and forgot to bring his epi-pen. A stranger with an epi-pen in her purse saved my son’s life. The doctor sighed, his eyes never leaving my little boy. I waited. Through a decade of constant vigilance and fear that was still, too often, not good enough, I prayed for my son. I never knew what to do with that stone. Some days I believed the good news: already healed. But the good news couldn’t fully erase the fear that we would make another mistake, miss something, forget something. And the good news seemed to offer little to a boy who ate his lunch alone at the “peanut-free table” and cried after every class party: I just want to eat what all the other kids eat. I can’t remember when we first decided to let him try dairy. Two years ago? A year? I know he asked for a long, long while before we said yes. I can’t even remember what we fed him. Was it a muffin baked with a little bit of butter? Or was it a waffle made with a small amount of buttermilk? How do you feel? Is there any scratchiness in your throat? What about now? Does your mouth itch? What about now? He ate one whole piece of pizza that night, but we still took it slow. The light of that good news announced for years to every one of my prayers was dawning, but Jonathan and I covered our eyes. We were afraid, I think, to look directly at the thing we had always desired. This year, our son has eaten cookies and cakes baked with butter. He has eaten cookies and cakes baked with milk. Twice, he ate a cupcake frosted with butter frosting. Once, he sprinkled parmesan cheese on his soup, and I didn’t stop him. On Thanksgiving Day, we realized too late we’d forgotten to buy almond milk. We made the mashed potatoes, Thaddeus’s favorite food, with real milk, real cream, and real butter. That night, having had no reaction to the potatoes, Thaddeus ate his first slice of apple pie with real whipped cream. “I like it,” he said, in a quiet voice. A week or so ago, I realized we were out of the almond milk Thaddeus has always used on his Cheerios and his oatmeal. Jonathan would be heading to the grocery store that day, but as I wrote up a list for him, I couldn’t decide whether to add almond milk. The only thing we had not yet tried giving Thaddeus was pure milk. I knew in my mind he could have it. He ate whipped cream! I knew he had outgrown his milk allergy, but over all these years, I have grown accustomed to doubt and fear. The last time Thaddeus took a sip of milk, he was three, and it was a glass meant for his sister, and the whole nightmare ended with a bloody mark on his pants from the epi-pen and a trip to the hospital. My pen hesitated until, finally, I wrote: almond milk (do we need to buy more?). 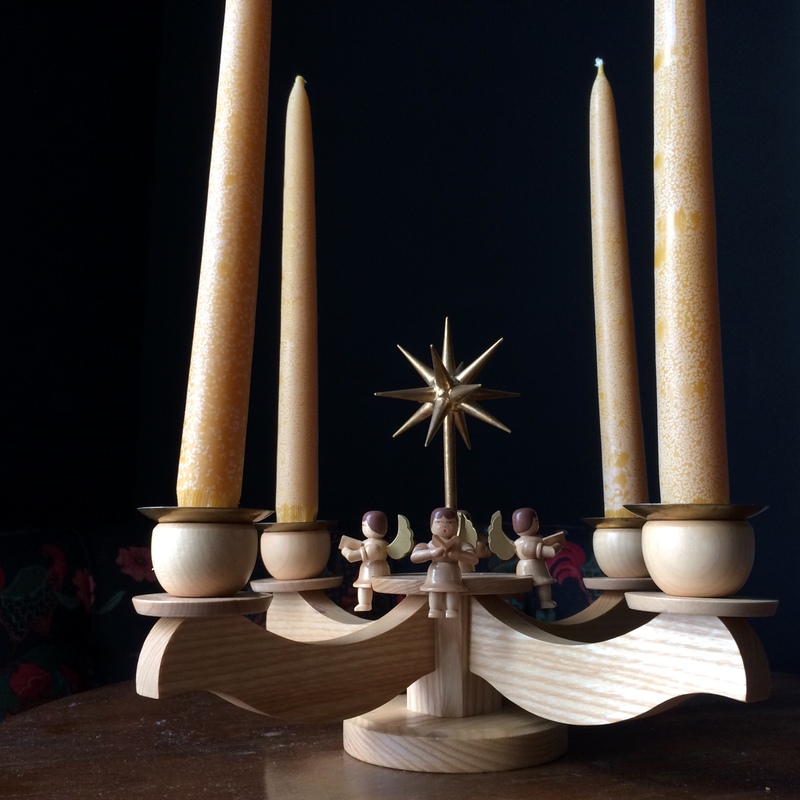 Maybe Advent is the long, slow leaning in toward the good news we do believe. Maybe Advent is a gradual waking up. The good news we have waited for has been announced in our lives. I have seen the evidence with my own eyes. My much-loved boy is no longer allergic to milk, and this year, for the first time, he and I will share a birthday cake made with real milk and real butter. But when I think about pouring him a glass of milk, my hand starts shaking with old memories and old fears, and I can’t do it. I haven’t yet done it. When Jonathan brought the groceries home, I saw the familiar box of almond milk amidst the bananas and the avocados. “You bought more almond milk,” I said to him. Jonathan looked at me. He didn’t say anything until he finally looked away. “It feels good just to have it in the house,” I said, and he nodded. We are waiting for Christmas. We are waiting for Christ’s return. But maybe we’re also waiting on ourselves. Gently and with patience. The Lord is with you. Do not be afraid. After such a long stretch of terrible news, it is exquisitely hard to believe in the good! I SO get this. Thank you for writing it out. Blessing upon blessing as you continue to live into this powerful, life-changing reality. Oh, how wonderful for your son. We praise you, Jesus. Our healer! I used to react to everything. Lyme Disease messed up my immune system. Reactions are gone now and I’m no longer the girl in the bubble. Your article gives me a great reminder of how much I’ve been healed and strengthens my belief that the rest of food sensitities will be gone too. I grew up in a household that didn’t follow Advent. The older I get I find that I need this message more and more in order to still my heart. As I struggle to “feel” Christmas, I turn back to my Bible and words of hope. After all, that is the message of Advent. Thanks for sharing your fears and hopes. Thank you, Celeste. I’m grateful for your listening ear. I needed to hear this today, thank you. I sobbed reading this. I know what you are saying. It wasn’t food allergies for us but two little girls who had atypical febrile seizures. Ones that wouldn’t stop without rectal medicine and many times without iv meds. Helicopter rides to the big city hospital. Hangovers and confusion for a couple of days from the medicines given. So not milk, but a sniffling nose would send my heart to my throat. Now it’s been 4 and half years since the last one. But they are on a medicine for it. The Dr. thinks they’ve outgrown it and we should try off of the meds, but I’m afraid to take them off of the medicine. They finally quit sleeping in our room just a year ago and they are 12 and 11 now. That fear… Waiting for the other shoe to drop. Oh boy, there is so much more too than I can type here. He’s been with us through it all. Much easier to see when the darkness is further away. I praise God with you for healed children. That is a powerful sentence. Thank you for this, Christie. I don’t know why we find it so hard to believe but we do. Crying and hoping with you. why do your blogs always make me cray? Oh, this is beautiful. I’m picturing him eating his first piece of apple pie, and being able to appreciate something so (deliciously) ordinary as a long-awaited gift. What a beautiful perspective. And your response – as parents – to be “cautiously optimistic” makes so much sense, and the gift of your son’s healing being a gift to your ability to trust God, each other, and yourselves. How I love God’s economy of redemption! I will always treasure this year of firsts. First pie. First whipped cream. First corn dog! 😉 There has been fear, but there has been so much fun. My sister just yesterday told me her son was diagnosed with all kinds of severe allergies. Thank you for your message on love and trust. Miss you! Oh, Cris, such a hard road, and I’m sorry for your sister and her son, but, yes, there is hope. Hope for healing as well as hope for the journey. I read this whole piece with tears choking my throat. And this line. This is exactly why. Goodness we love you guys and your Thad! Thank you for taking the time to leave this note, Daniel. You encourage me! May God continue to guide you and bring comfort as you walk this hard, hard road. That place of forgetting to expect good from the hand of God is so hard. It is a trauma that robs us of our capacity to hope, without which, our faith falters. Abraham, Naomi, Simeon and Anna – I think these stories of hope, and hope almost lost, are gifts to rejuvenate both our desire and increase our faith. And in his mercy, God also gives us our own stories. I am glad He has given this one to you. May you find your faith – that deep assurance of things hoped for – strengthened by it. I am, I fear, in a season of being “afraid to look directly at a thing I have always desired” – not a thing received, but an opportunity opening up. This encourages me to take a hard, brave look. Beautifully, powerfully said. Thank you, Judy. Even happiness requires courage, I’ve found. May you be brave! Tears – you are describing my next to youngest grandson, except for the total healing part! I pray this for him. TX for sharing your experience! Yes, I get all of this. The fear and the rejoicing. Praying for your little boy and giving thanks with you. What an awesome, inspiring story especially @ this time of year. It puts things into perspective in our mundane everyday lives. Thank you soo much for taking time out from your book to listen to your heart from His. When you listen to Him I find there’s always time to take care of those closest to our hearts; stay calm & praise God when you want to panic, it’s ok to scream in your mind!! Sincerely, Kathy from LA.